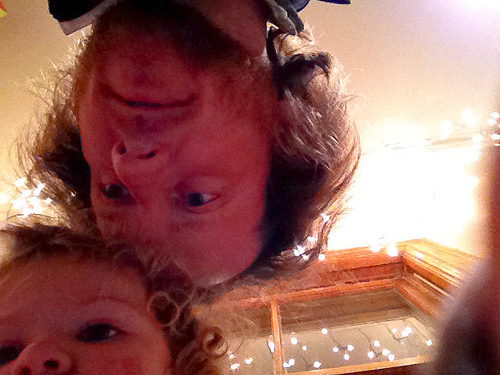 sparklet has discovered the photo booth app on the lady sparklers iPad. As a result, instead of it being filled up with screenshots of muppets, the iPad is now filled with shots of sparklet staring at the iPad’s screen. sparklet has a new ipad app, and a new found southern accent. the new app is “elmo’s monster maker” which lets her pick a muppet and then add custom eyes, noses, and hats. you can also have elmo come out and take a virtual snapshot of your monster, and our ipad photo gallery now has 200 pictures of monsters in various states of creation. the funny part actually comes from sparklet’s new pronunciation of the word ipad by saying “i-pay-yad” — like the 65 year old southern lady that she is. I’ve changed phones, again — temporarily. With my new gig, I’ve been issued a Blackberry Bold — a newish model Bb with most the bells and whistles, but a step below the fancy-pants, big/touch screen models you see being pushed on TV. I’ve actually never had a Bb before, which in itself is amazing. I had an iPhone for two years, and then the HTC Incredible. Bb’s were just becoming a thing when I left the Hill, but at that point only the Members and Chief of Staffs had them — unlike now, where they give them out like candy. No reason to panic if you’re trying to reach me — I’ve already forwarded my old phone number, all the texts that may come in, and I’ve setup the Bb to check my person email address to boot. It’s all good. I’m strangely excited — we’ll see how it’s going in a month. as a pre-emptive thank you gift, i bought the lady sparkler an ipad — mainly for the near-term pain she’s going to face with me switching from a 35 hour/wk job to one that’s more like 50 hours/wk. turns out, we had the thing for a sum-total of 72 hours before sparklet learned how to turn it on, navigate to the main menu, load up the photo application, select a photo from the index, and start flipping through the pictures. i’m starting to wonder if we’ll ever see it again. After 20 long months of AT&T suckage, i have finally taken my iPhone back to that great Daisy Hill Puppy Farm in the sky. While the death-throws of our relationship have been well documented, baby sparklet was the two-ton brick that finally broke the camel’s back. One afternoon in March, baby momma thought she was playing phone tag with me about some scheduling — she left me two voicemails and three text messages — but AT&T didn’t deliver any of them until it was too late to do any good. Turned out it was nothing important, but neither of us particularly wanted to discover what it felt like if it *had* been something more life-or-death. i got the HTC incredible — is one of the new-fangled google android phones. it has all the applications i used on the iphone, and has got some crazy social media integration (my address book entries link directly to their corresponding facebook and twitter accounts). but the think i love most about my new phone is that it rings when called, and voicemails don’t get lost for days on end. i know it’s crazy, but it’s kind of nice having a phone again. speaking of saying goodbye, when the iphone died we kicked foursquare to the curb as well (foursquare was the location-based social media application that made her “mayor” of her favorite playground). in the end, it was just too darn competitive. while we thought it was fun to keep track of where we had been, foursquare is setup to be a game, and the person who checks in the most wins. this was cute and all, but we apparently live within blocks of the #1 foursquare user in D.C. — with an average of 20 check-ins per day — and so our mayorships were under constant threat. eventually, when I found myself making decisions on where to go based on where our mayorships were threatened, it struck me as the time to call it quits. instead, we’ve swapped over to Gowalla which is waaaaay more low key. there are no mayorships, just rewards for going places and trying new things. i’m saving up sparklet’s competitive streak for team sports.